I have just about the worst memory in the world. Okay, that's probably an exaggeration. but it's not that far off. My grandfather has a terrible memory, my dad isn't too far behind him, and I can tell that it won't be long before I'm in the exact same boat. I think it's accelerating with each generation. If I ever have a son, he'll probably have Alzheimer's before college. It's depressing! Does this sound familiar...you think of something you need to do, and then NO MORE THAN 5 SECONDS PASS and you've completely forgotten what that was. No matter how hard you try to remember, it's gone. I tried a lot of different ways of keeping everything in one place...I tried storing files on Dropbox (which I love, btw). I tried emailing myself everything I wanted to remember. I tried calendars. 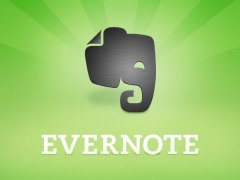 I tried all of the different to-do lists online and nothing quite seemed to work for me until Evernote. Rather than go over the features like a step-by-step tutorial, I'll just tell you how I use it...let me know in the comments if something doesn't make sense or if you have questions. I spent about an hour and a half per day in the car driving back and forth from work. I have a LOT of thoughts during that time. Since I'm driving I can't exactly send myself an email or write anything down, but that's where the Evernote Android app shines. I just tap an icon on my phone and it starts the voice recorder. I just say whatever I want (keeping my eyes on the road) and when I'm done I tap the Save button. It's instantly uploaded to my inbox for me to review later. It also has a one-tap button to take a photo, and any text in the photo becomes instantly searchable in Evernote. If you either don't have a scanner or you don't have one handy, a quick photo accomplishes the same thing since you can search the words in photos. If you see something in a store that you want to look into later, just snap a photo into Evernote, it will be there next time you open it up. For me, I spend all day putting things into Evernote (voice notes, photos, text notes, emails, etc) and then the first thing I do when I get home is look in my Evernote "inbox". Anything that requires action I do or put in a queue, everything that's for future reference gets tagged and put away. For example, anything I buy, I'll download the user manual for it, tag it as "user manual" and forget about it. That way if I need to find a part number or something 2 or 3 years from now I'll be able to find it with no problem. Another handy use is anytime I have to call into a company, whether it's my cell phone provider, the local electric utility, or scheduling an appointment with the vet for my dog, I just open up Evernote and start typing the details of who I'm speaking with, what time it is, and what we discussed. Then I tag it and forget it. If I ever need that information, it's right at my fingertips wherever I am, thanks not only to the desktop app but all of the mobile apps they offer.